I know, I know, everyone’s been starting the new year with juice cleanses/sugar free challenges/new body resets, and I’ll admit, I’ve been tempted to start eating healthier myself. Then these churros happened. And I lost all self control. Have you ever made a choux pastry before? When I was testing these a week or two ago, I started off by making these Pâte à Choux pastries from the Kitchn (y’all know I loooove the Kitchn), just to get the hang of it. Traditional churros are basically fried choux pastries, piped into logs and rolled in cinnamon sugar. 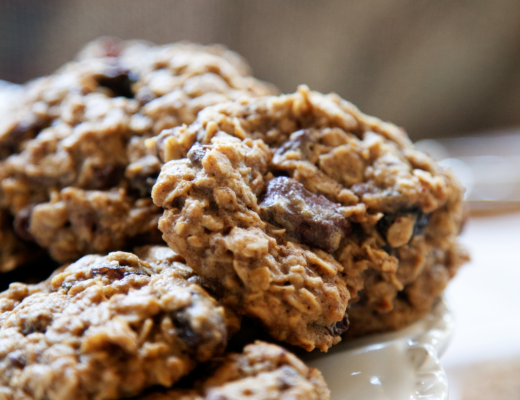 They’re the best, and actually surprisingly easy to whip up! Don’t let the stovetop and seemingly-intimidating-piping scare you. Side note: these churros kinda remind me of the cronuts I had in New York (here), and now I’m actually having post-NYC withdrawals. Anyone else? 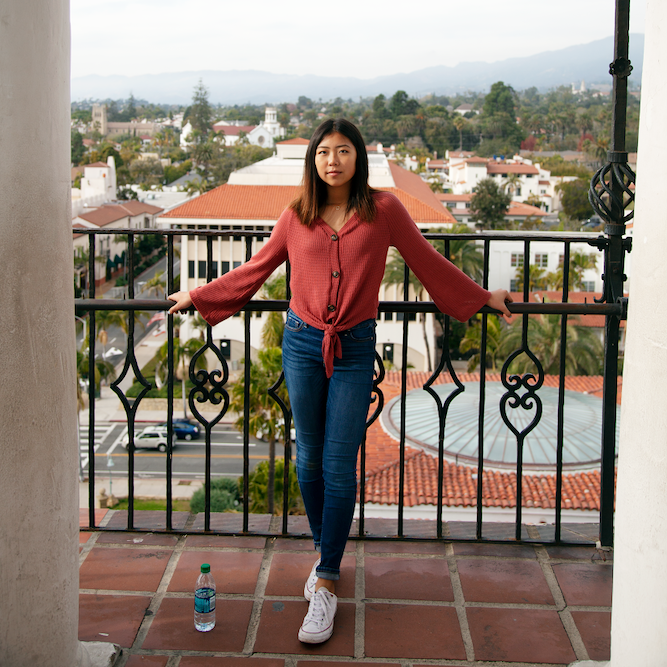 Where did you go for the holidays? I’d like to state a mini-disclaimer: traditional churros will ALWAYS have m’heart. But taking the time and effort to buy a fancy thermometer, heat up a ton of oil, fry the churros (while worrying about if they’re gonna turn out soggy or burnt), letting the excess oil drip off, and then finally rolling them in sugar, is not something I want to do. I just want a freakin’ churro! 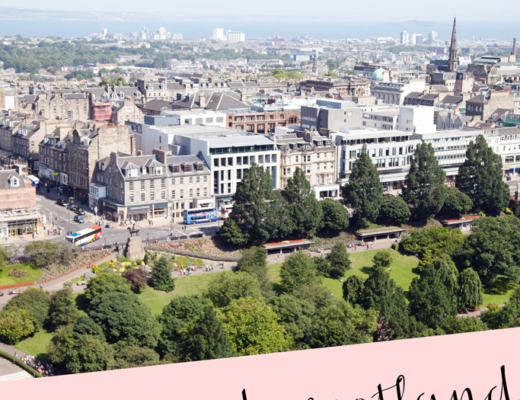 Without the hassle! That’s all I’m asking for! 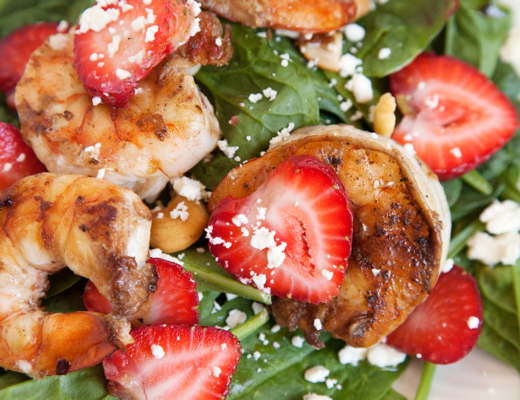 If you’re like me, this recipe is right up your alley. They take 15 minutes to bake, and come out the same every single time no matter how many times you make them. They won’t be soggy or burnt, and they’re a little better for you because they’re oven-baked, not fried. And, finally, essentially all you need is butter, sugar, water, eggs and flour. 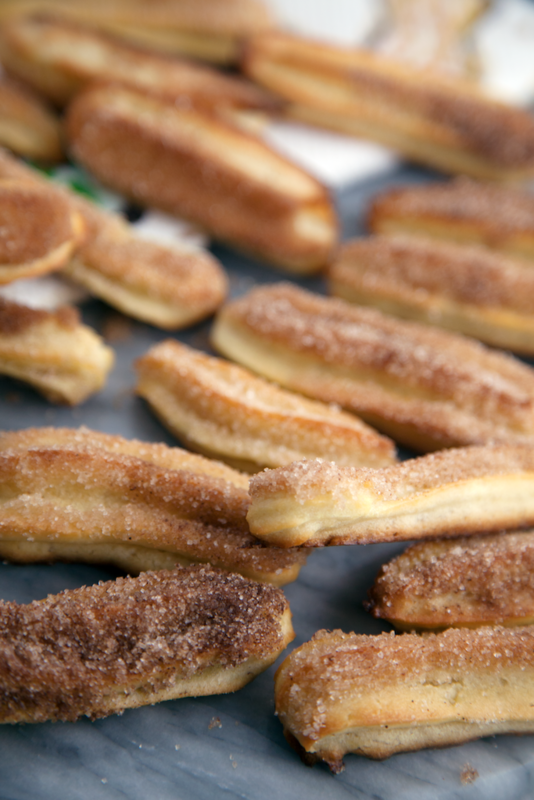 BAKED CHURROS FOR THE WIN!!!!! 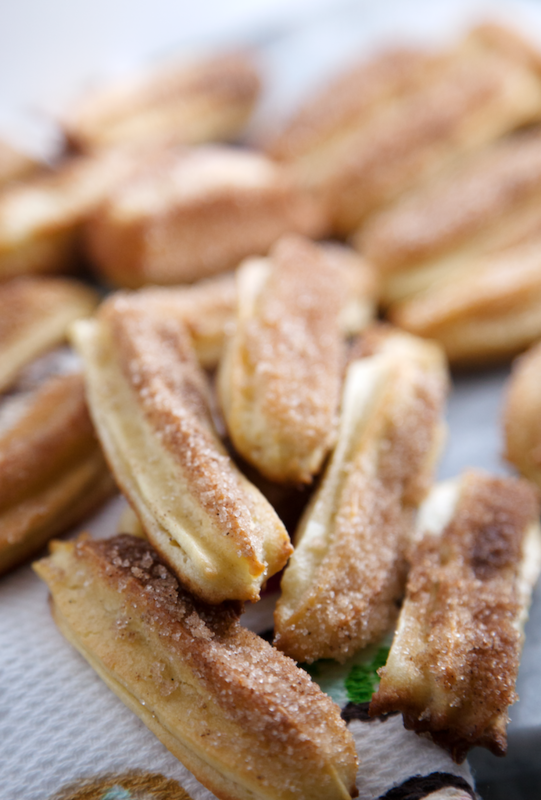 If you decide to try and make these, pleas indulge, because these baked churros are simply the best. 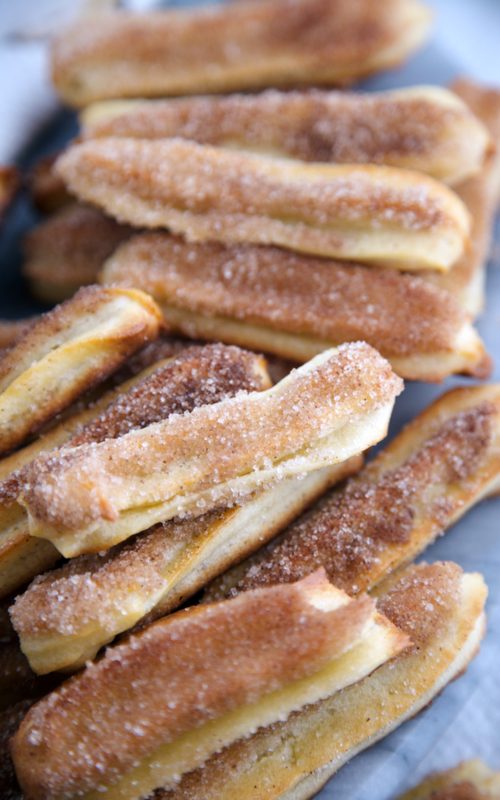 If you ever thought making churros would be too hard, my sweet baked churros recipe is perfect for you! It's just a simple choux pastry, piped onto a baking sheet, and rolled in cinnamon sugar. No fryer required! Preheat oven to 425ºF. Line a baking tray with parchment paper, and set aside for later. In a small saucepan over medium heat, melt together the butter and coconut oil. Add the brown sugar, cane sugar, and salt, then stir to combine. Increase the heat to medium-high, then bring the mixture to a boil. Add flour, then whisk until a dough has formed and has pulled away from the edges. Scoop the mixture into a piping bag fitted with a star tip, and pipe logs onto the baking tray. I wanted mine to be cute and little, about 3 inches in length, but you could make classic long ones if you want to. 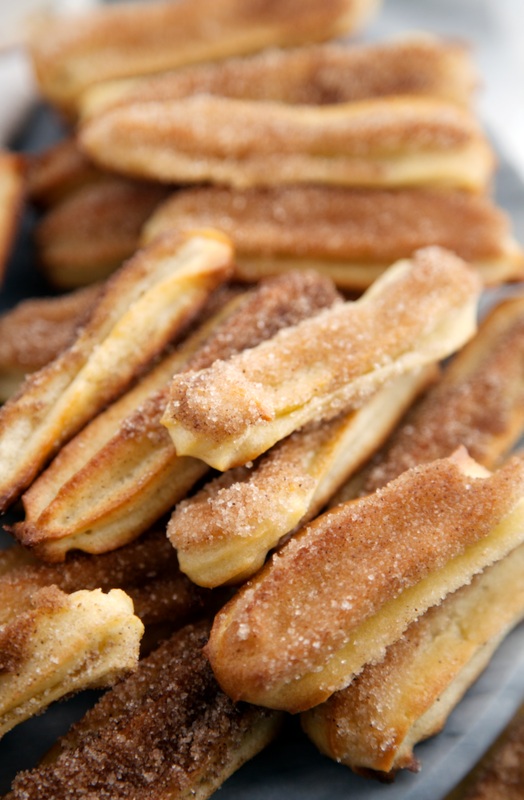 Bake for 14-16 minutes, until churros are golden brown. In the meantime, stir together the ¼ cup sugar and cinnamon to create a cinnamon sugar mixture. 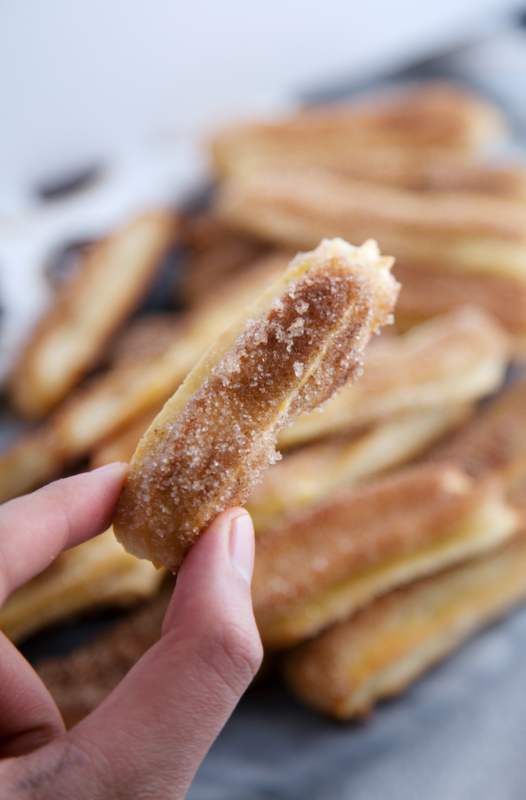 Once the churros are baked and cooled, brush a little butter over top with a pastry brush (just so the coating will stick - you could do this with coconut oil, too). Dip into the cinnamon sugar mixture, turning to coat. Enjoy!! !